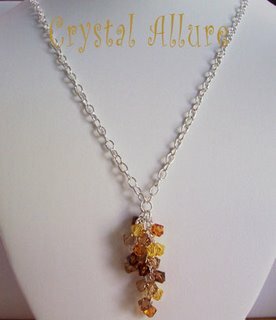 As a strong supporter of animals I am honored to have donated the Harvest Falling Leaves Crystal Cascade Necklace (N090) to the 3rd annual Bark and Whine Tasting. This event is hosted by the Humane Society at Lollypop Farm (Fairport, NY) and details of this wonderful charitable event for animals are listed below. With over 18 points of shimmering Swarovski Crystals in various shades of topaz, accented against a sterling silver chain this handcrafted necklace is absolutely stunning! I chose to donate this particular Fall Beaded Jewelry necklace for various reasons. But, the most obvious is it's beautiful design! At 13" in length this necklace will stand out in a crowd and its' colors are reminiscent of crisp, Autumn days. Don't miss out on your chance to bid for this gorgeous Crystal Allure Jewelry design original! Celebrate the Spirit of Masquerade at the 3rd annual Bark and Whine Tasting. Join us for a Venetian carnival with a sophisticated twist. Our 3rd Annual Bark and Whine Tasting event is Saturday, November 4th at 7:30 pm at Locust Hill Country Club. This enchanting evening includes extensive wine tastings, fortune tellers, roving magicians, silent and live auctions, and The Maria Gillard Band. Enjoy sampling great wines (tasting organized by Wine Sense), bidding on popular auction items, and a selection of hors d'oeuvres and decadent desserts. Tickets are $100 per person. Traditional Masquerade dress optional. For more information or to purchase tickets call Christina Dauenhauer at Lollypop Farm at 585-223-1330 ext 241 or order your tickets now online. As 2006 nears the end of the year, there are only a few local shows left to showcase my jewelry and accessories with. Since starting to do shows this year I've found a mixed bag of results and observations. I'm looking forward to the new shows I hope to sign for 2007 and look forward to seeing you all there! This past show at the Union Hill Fire Department was what I expected it to be. Just about everyone who walked in actually looked over my table -I've been at a few shows and some people don't even want to step in! I think that really comes from how I set my display up -it looks very professional and I've been commented on it time and time again. It was profitable enough with a few sales and interestingly, this time quite a few people asked me for jewelry making advice and techniques! I hear over and over how beautiful my jewelry is and I am ever so grateful for your comments! Thank you, thank you!! Sadly, the only disappointment to me was that of the jewelry vendors there (which is somewhat hard to count because what is happening now is jewelry vendors are showcasing a lot of other crafts -but their true craft is the jewelry...so just about everyone seemed to be selling jewelry in some fashion). What I found was those exclusive to jewelry (there was about 33 vendors -give or take -and four of those were exclusive to jewelry) just two were actually handmade! The other two were company's set up like Mary Kay cosmetics -the jewelry was not handmade by the seller -rather they were just a representative of the company. So now I completely understand and do not get too frustrated over the question, "Are your products handmade?". It baffled me at first when I started these shows because that's what the shows were suppose to be about -handmade/handcrafted items. Although in all fairness the "bigger" shows do adhere strictly to these guidelines -which is why I'll be targeting them next year! But all in all it was a good day and I had the most wonderful conversation with a customer. I never got her name but she asked me all about my main material, Swarovski crystals, and also about upcoming show dates and a few of my products. As she looked over my earrings she even asked me about my FALLing Leaves earrings -and I was excited to tell her the story behind why I designed those! This lovely woman also purchased them and I explained to her that she will be the proud owner of these earrings not only for their design and durability but also because she'll be only the second person to own this design. I only created two sets of that earring and there will only be two individuals in the United States who will own a pair! She was very excited about that -and that topic led into more conversation about the uniqueness of my designs. Again, should she read this blog I wish to thank her for her sincere interest in my designs and again for her purchase. Of course there are a lot of other talented artists there and I made a few purchases myself! Just couldn't resist some of the items that I know I'll never be able to do -and they'll look great in my house! Now, while at this recent show I realized that I had a ton of new designs that I had created, tagged and put up in a few shows but never got on the website! So, you will see in the next few weeks all these designs being posted (assuming someone hasn't beaten you to the punch -they'll still be available if posted). Mostly they consist of earrings (since in addition to beading, I'm an earring addict!) but there are also a few watches (beautiful, beautiful designs!!) and some necklaces. Stay tuned.....better still sign up to the newsletter and you'll be notified when these new items will be available AND you'll be eligible for contests and giveaways! On Saturday, October 7, 2006 Comfort Windows and Doors will be holding an open house. While there, you will find some of Crystal Allure's exquisite crystal bouquets on display! I am honored to have been asked to showcase my crystal bouquets at Comfort Windows and what better place to see their exquisite beauty?! Sitting in those front bay windows catching the rays of the sun....there are no words to describe it. From every angle they sparkle and shine -it's almost mesmerizing! Even better news -if you happen to be in the market for windows and you purchase from Roland Boisevert he will thank you with a Crystal Allure original suncatcher!! These suncatchers are new to my line and make beautiful window decorations -especially during the fall/winter. All it takes for them to sparkle is just a hint of sun! Feel free to stop by and see my crystal bouquets during the open house hours. Although I won't be there to greet you, I have a show I'm already committed to, just ask Roland for my business card and he'll be happy to provide one to you. Just wanted to send out a quick reminder about the upcoming jewelry show. This show will be indoors which should make for a slightly warmer shopping experience! Be sure to check out the October specialty items in support of Breast Cancer Awareness and Healthy Lung Month. Also, I'll have my inspired fall beaded jewelry designs there as well. 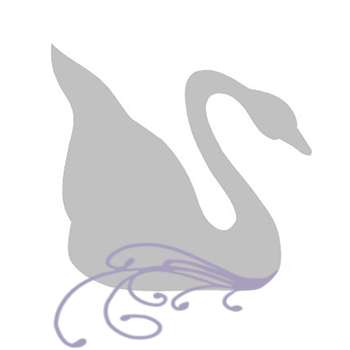 Come by, mention this blog posting and enjoy 20% off website prices. WHERE: The Union Hill Fire Dept. Everyday we take for granted our ability to breathe -but it's not that easy for millions of people with lung diseases. October is Healthy Lung Month and a great time to learn more about the lung diseases that affect more than 30 million Americans. Cystic fibrosis, lung cancer, asthma, and chronic bronchitis are just some of the lung diseases you may have heard of. Being short of breath can make everyday activities seem like a chore rather than an enjoyment. Consider this: have you ever gone outside on an extremely cold, frigid, windy, winter day and the wind just slaps you in the face with such force and shock that you actually feel like you've lost your breath and you can't breathe? This is how some affected by a lung disease feel -everyday. So how can you keep your lungs healthy? What can you do to help raise awareness of these lung diseases? Well, if you smoke the first place to start is to STOP SMOKING and/or avoid secondhand smoke. More than 87 percent of lung cancer cases as well as most cases of emphysema and chronic bronchitis are caused by tobacco smoke. And for those with cystic fibrosis, smoke and secondhand smoke further compromises their lungs. I hope this does not sound like an anti-smoking message. But the evidence speaks for itself. Smoking is BAD. Of course, exercise is an excellent way to keep your lungs healthy -give them a good workout!! If your lungs are already compromised don't despair! There are still exercises you can do -just consult with your physician first before starting any exercise program or routine. You can also make a difference by raising awareness. One lung disease of special interest to me is cystic fibrosis (CF). This is one disease I'd like to see disappear! Yet, you'd be surprised not many people have heard of CF. Sadly, I've even come across some physicians that didn't know what it was or how to test for it! Those with CF can and should still exercise but ultimately they will need a lung transplant to survive. So how can you help? An excellent resource for cystic fibrosis information and awareness activities is the Lungs for Life Foundation. I urge you to check them out. 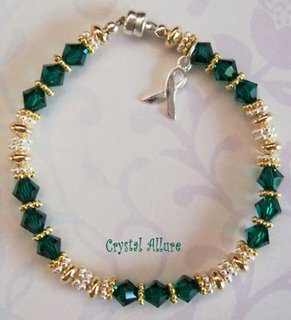 Another great way to get involved this month is to purchase your cystic fibrosis awareness, organ donation awareness, transplant awareness, survivor and co-survivor jewelry from Crystal Allure Creations. Remember, your purchase of my designer awareness jewelry will benefit the charity identified in the product description. What better way to get involved than to show your support AND look fabulous!! !